Two studio portraits of Peter and Marie Thowe and their family in Alma, Kansas. The first photograph was taken in 1894 and the second was taken for their 50th wedding anniversary. 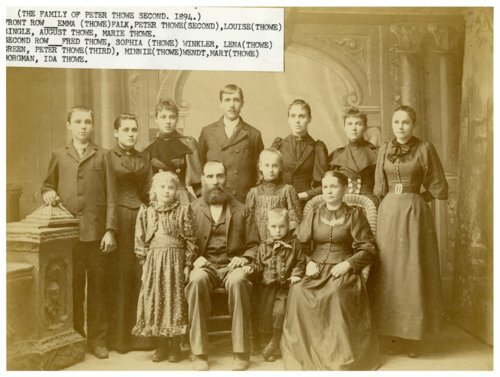 They had ten children born between 1873 and 1890: Peter Thowe, Sophia Thowe Winkler, Mary Thowe Borgman, Lena Thowe Green, Minnie Thowe Wendt, Ida Thowe, Frederick Thowe, Louise Thowe Ringel, Emma Thowe Falk, and August Thowe.